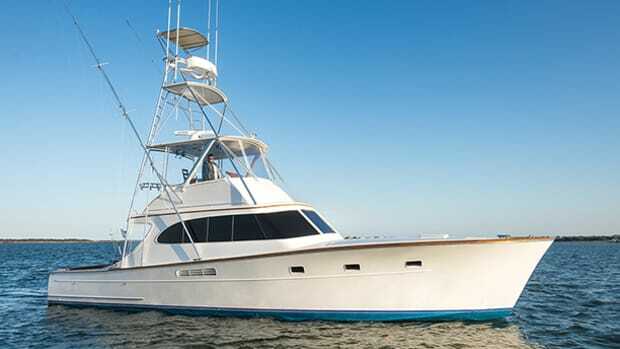 A Down East-inspired Shannon Voyager 36 might be just the ticket to your cruising dreams. Appealing lines, well-protected exteriors, and a deckhouse that features plenty of windows: The lure of owning a classic yacht runs deep. 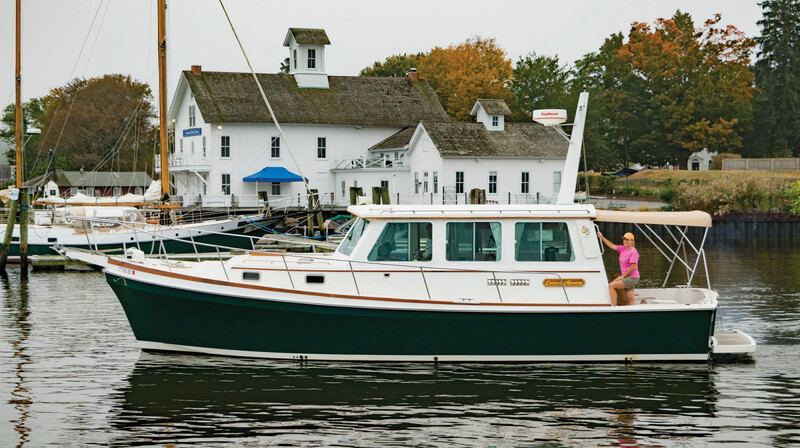 The lure of owning a classic yacht, like a Down East-inspired cruiser, runs deep for boat owners who prize lines that are always easy on the eyes, exteriors that are well protected for those moving around under way, and deckhouses that feature plenty of windows. And if that yacht is well built, and suited for use in open waters in a wide range of conditions, its usefulness and value climb quickly. The Shannon Voyager 36 is such a vessel. 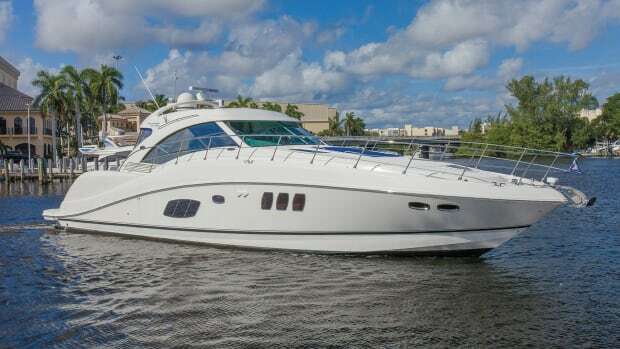 It was first built in 1991 as a flybridge yacht, just as Down East cruisers were enjoying phenomenal growth in popularity. Chelsea Morning is Hull No. 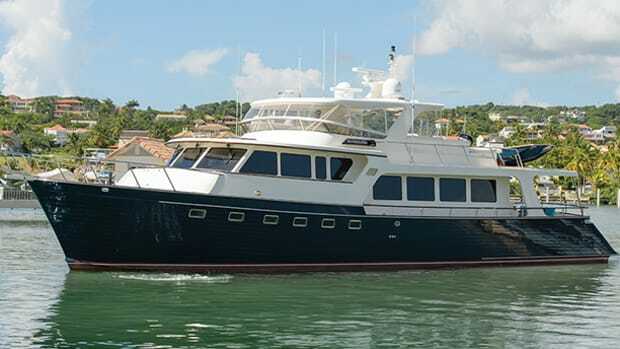 9, built in 1993 without a flybridge at the original owner’s request. This Rhode Island-based builder of semicustom offshore sailing yachts, founded in 1975 by Walter Schulz, has a long history of satisfying this type of individual preference. 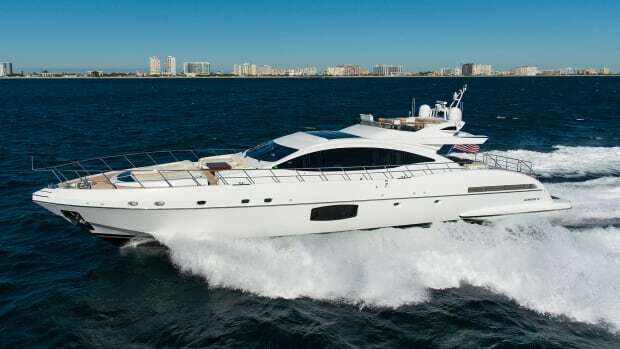 The yacht has all the elements of a desirable cruiser, starting with a nicely sprung sheer that rises high forward over a distinctly flared bow to deal with big waves. A sharp entry and deep forefoot below the waterline soften wave penetration at speed, and full-length chines make for a drier ride and good roll stability. Her wide beam carries well aft and allows for spacious volume and she runs modestly fast on a semi-planing underwater surface. The salon invites you to kick off your Sperrys and stay a while, thanks to warm woods and sailboat-style charm. 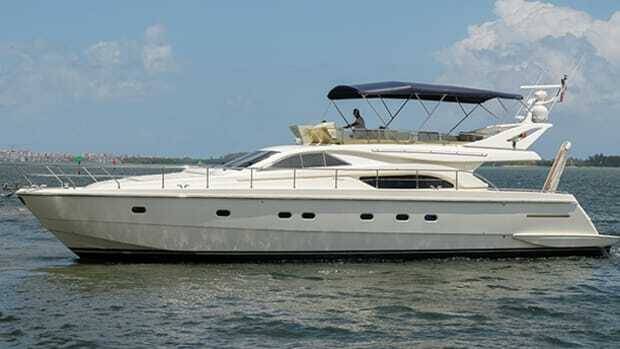 As a semicustom boat, the Shannon 36, especially the later models, could be powered by twin 300-horsepower Caterpillar 3126 diesels for a cruising speed of 16 to 18 knots. The builder reports a top end of 25 knots with this power, and a cruising range of approximately 500 nautical miles, depending on conditions and the speed selected. 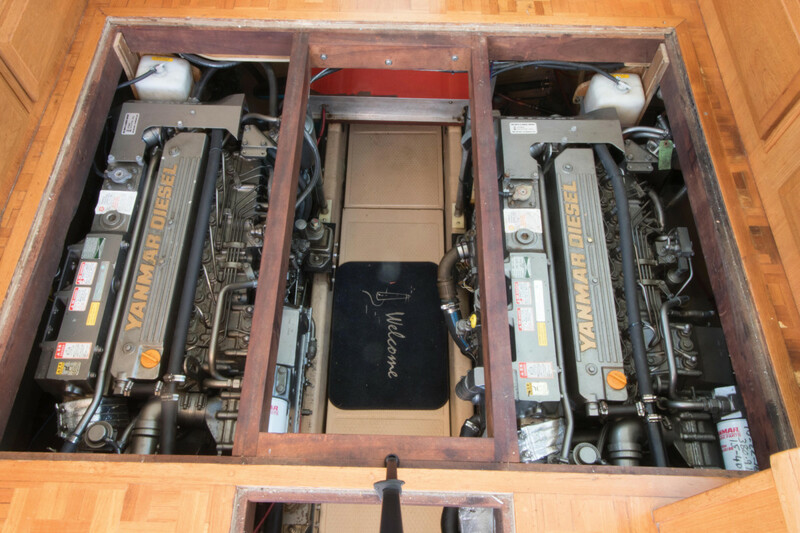 The first owner of Chelsea Morning, which was originally powered with a pair of 250-horsepower Peninsular Diesels, had the yacht repowered in 2003 with a pair of 370-horsepower Yanmars that produced upper cruising speeds from 18 to 25 knots; top speed was 30 knots. 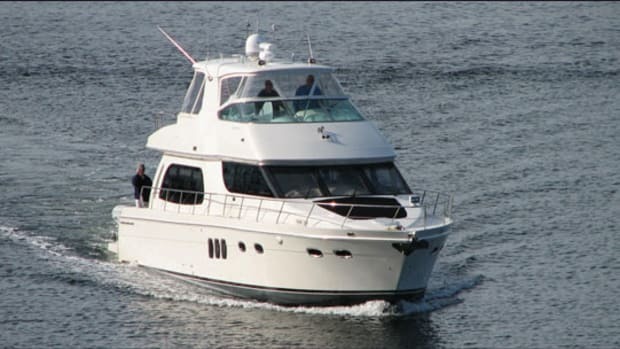 Like all Shannons, the Voyager 36 is built with proven construction techniques that optimize the yacht for open-water cruising. Shannon adopted isophthalic gelcoat in 1978, as well as vinylester resins and epoxy undercoating in 1986, to mitigate osmotic blistering. Hulls and decks are composite laminates employing linear foam and an engineered mix of unidirectional and high-glass-content laminate fabrics for strength. 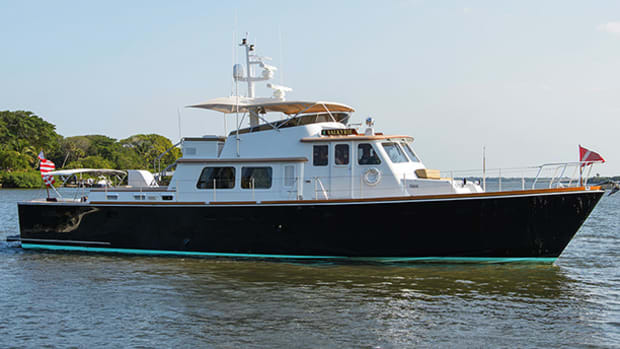 In short, Shannon is known for building yachts that will satisfy the needs of distance cruisers who want to tackle open water; that reputation impressed the original owner of Chelsea Morning. 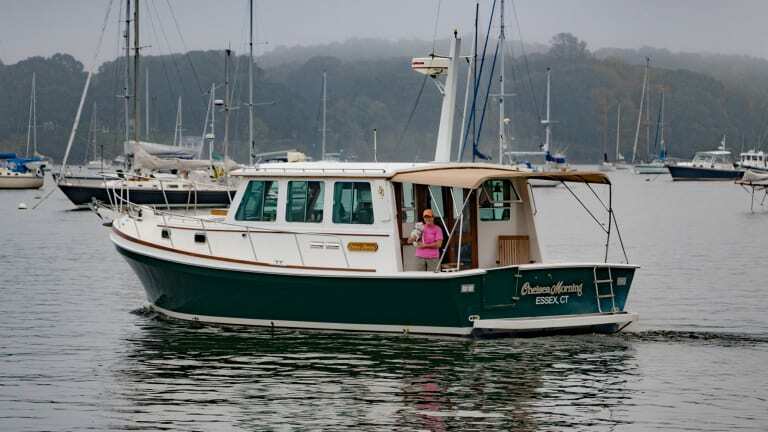 The Mellingers were attracted to Chelsea Morning in part because she was a two-owner boat from a well-regarded builder, and because the previous owners were meticulous in their care and maintenance of the yacht. This is typical of many of the yachts represented by Essex Yacht Sales. Leslie Quarrier, a CPYB member, is the principal and lead broker for the company. With more than 25 years of experience, she understands the cruising yacht market deeply. The featured listings and recent sales on the company website illustrate this point. On deck, there are numerous features to consider. 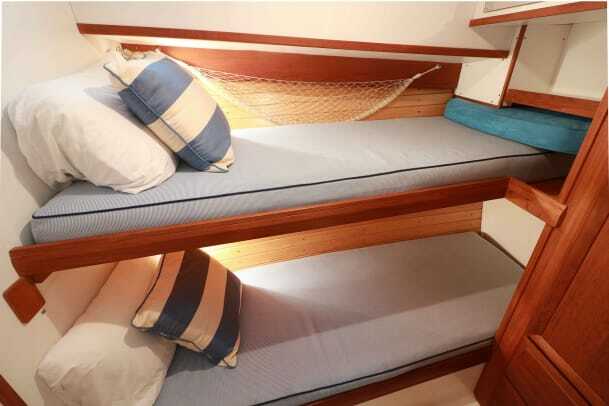 The attached swim platform features teak grates for fast drainage, there’s a portside transom door for easy boarding, and a teak-planked open cockpit (with a canvas bimini for protection from the elements) large enough to accommodate folding chairs. Molded steps lead up to the side decks, which are initially narrow because the designer pushed the cabin sides wider amidships than one would expect for a Down East-inspired design, but Shannon also equipped the boat with lots of well-positioned stainless steel handrails and a wider deck forward of the sliding helm door to make anchoring or line handling simpler and safer. The anchor platform stores two anchors, which serious cruisers will appreciate. A well-lit master is forward. Generally speaking, the salon layout is galley-up, with a small settee aft and an L-shaped galley plus companion bench seat forward on the port side. On the starboard side, there’s an L-shaped convertible dinette aft and the helm forward. 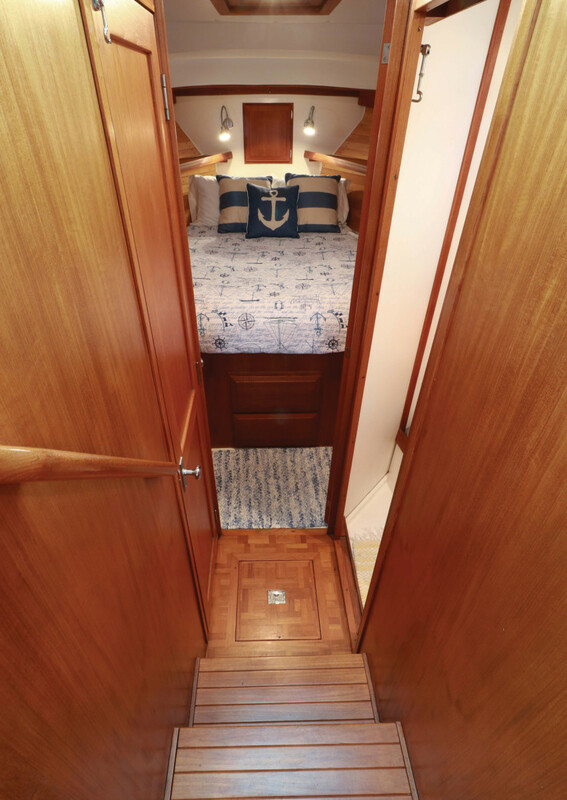 A centerline set of companionway stairs leads down to an owner’s cabin in the bow, a head compartment with shower/tub to port and a bunk-equipped guest cabin to starboard. Within this plan, there are some interesting and desirable features. Double “French-style” teak and glass doors to port of the centerline open wide to blend aft deck and salon spaces, all on the same level. 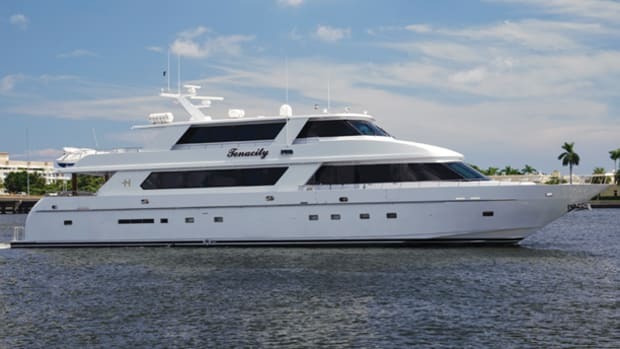 In application, it successfully resolves the builder’s efforts to have the galley positioned to serve passengers seated inside and outside equally well. Upper and lower glass panels in the doors make “checking your six” that much easier, as do the opening windows in the flanking aft bulkheads. Not only is there great natural light in the salon, but with three overhead Bomar hatches, an opening centerline windshield panel, and sliding windows to port and starboard, natural ventilation is good, too. There are also outstanding sightlines for the helmsman as well as the guests. If Chelsea Morning had a sliding sunroof, she might have been the best naturally ventilated and illuminated yacht of her decade! Because sometimes it’s desirable to master the weather inside, Chelsea Morning was also equipped with a 5-kilowatt Westerbeke diesel genset and a pair of 9,000-Btu Marine Air air-conditioning units. And because the engine compartment is located beneath the salon sole, there’s always plenty of room to inspect and service components, as well as make daily engine checks prior to startup; here, you won’t have to crawl into a small space with no overhead clearance. A quick glance at the helm shows an area ideally suited for sitting or standing during operation of the yacht, with a large custom Edson teak-rimmed stainless destroyer wheel. I like the electrical panel near the helm, and this one is well-positioned for ease of activation by the helmsman. The large chart flat on top is well suited to bracket-mounted electronics, and for those who prefer flush-mounted electronics, there appears to be plenty of room for console modification. The fit and finish of any vessel is a clear indicator of the builder’s care and craftsmanship, and Shannon is well regarded on both counts. 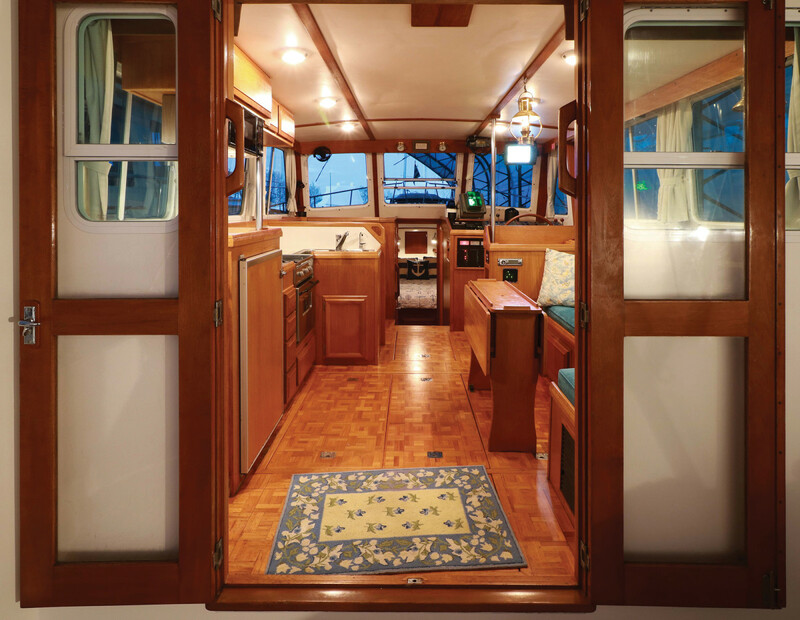 The satin-varnished teak cabinetry, white-laminate bulkhead panels and teak trim harken back to the days when wooden boats were king, and their craftsmen were appreciated as artists. The varnished teak parquet cabin sole was a well-accepted feature of hand-built interiors when the 36 was built. 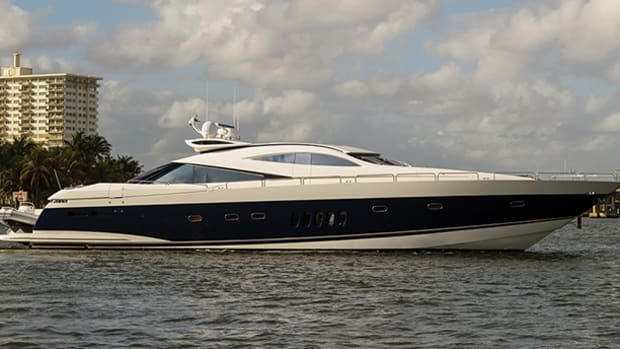 The Shannon Voyager 36 has proven itself a capable distance cruiser as well as a comfortable weekend getaway yacht; that’s exemplified in Chelsea Morning. It seems to me that if you’re a fan of Down East cruisers, this is one design you can’t afford to overlook. This Shannon was repowered with Yanmars for improved efficiency and range.